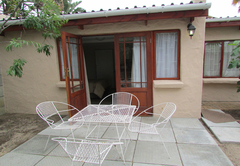 Southcliff Guest House is a highly recommended property providing self catering in Table View for tourists visiting the Blaauwberg region. 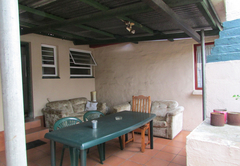 Southcliff is a self-catering Guest House situated in Table View, Blaauwberg, versatile in the sense of accommodating family groups on holiday to single individuals on business. Southcliff is ideally situated for visits to places of interest such as the wine farms, the Cape Town Waterfront and City Centre, Century City, Grand West Casino, the Wine Route, Killarney Motor Race Track, bird-watchers paradise of Rietvlei, flamingos and pelicans in abundance - nice to see them flying in formation when coming home to roost. Four bedrooms, 2 en-suite and 2 sharing a separate shower and a separate bathroom. These bedrooms each sleep 4 people, with a double bed and 2 singles (bunk beds) in each room, making them ideally suited for families. This facility has a large fully equipped kitchen leading into a large TV lounge and dining room. The adjoining east wing, with its own entrance, has 2 rooms en-suite, each with 2 single beds, a TV, fridge, microwave, toaster, kettle, etc. One room is equipped with a mini kitchen. The Main House and the East Wing can be rented as a single unit to house a large family group that sleeps up to 20 people. The Southcliff Garden Flat is situated in the garden, surrounded by bird aviaries and the ducks swimming in their pond. The flat that opens up onto the swimming pool has one bedroom en-suite, a TV lounge and an open plan fully equipped kitchen. 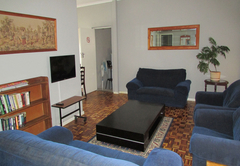 This flat has a sleeper couch in the lounge and is ideal for 2 adults and 2 small children. 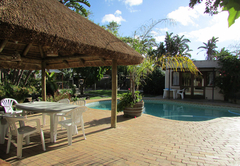 There are a number of braai (barbecue) facilities a large swimming pool and most importantly safe parking, on the complex, behind automated gates. All TV programs are available. Southcliff Guest House is located in Table View a suburb along the West coast of Cape Town with all its own facilities, two shopping centres in walking distance, numerous pubs, restaurants, 15min from the Cape Town city centre, 3km from Table View beach and adjoining Bloubergstrand famous for its picturesque sun sets over Robben Island. Then there is the West coast paradise of Langebaan lagoon, good fishing, windsurfing and water sport a mere 1 hour drive from us. Not not far from Langebaan is the famous Paternoster crayfish fishing village and the West coast village of Darling marks the beginning of the spring Namaqualand wild flower display routes. I am a keen fisherman and I do offer fishing trips to Langebaan on my fishing boat, season and weather permitting. Golf course nearby, Virgin Active, many restaurants, cinemas. Hospitals and Medical Centres close by. 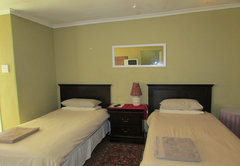 Here are 2 rooms with 1 double bed each as well as 2 single bunk beds. There is a shared bathroom with toilet and bath as well as a shared shower. The guests in these room have use of a large lounge, dining room and fully equipped kitchen which makes it perfect for a family or group. 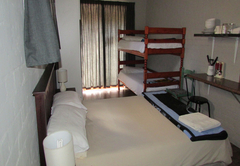 These rooms each have a double bed as well as 2 single bunk beds and can sleep 4 adults. 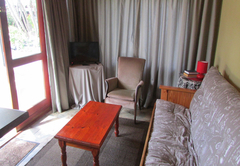 They have en suite bathrooms and well equipped kitchenettes. 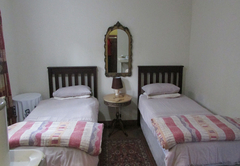 These rooms can be incorporated into the Main Guest House for larger groups. 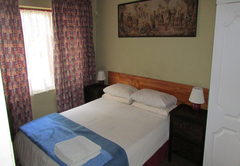 These rooms have two single beds, en suite bathrooms and kitchenettes with all the necessities. This flat overlooks the swimming pool and has 1 bedroom en suite with a sleeper couch in the lounge. 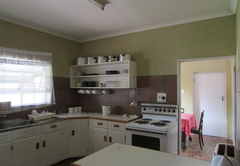 It has a fully equipped kitchen, and is perfect for a couple with a small child. This newly built modern flat is in the garden facing the bird aviaries. It has an open plan bed/living room with fully equipped kitchenette. 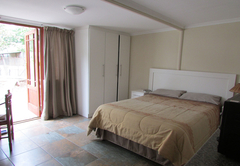 There is a double bed as well as a single bed in this unit. WE ENJOUED OUR STAY VERY MUCH. THE CHILDREN HAD A BALL IN THE POOL, ON THE LAWN AND THEY ENJOYED THE BIRDS AND THE FISH POND.